Discussion in 'General Discussion' started by Epic Buttstomp, Mar 19, 2019. Placeholder for this week event. Most likely I will play with Chuck in #4 position for faster 2nd turn SS. Master Rooster may give more damages with the 75% boost. In terms of current highest boosted crew, it's these guys, will I use them as is who knows, plenty of options to choose from. The Master Claude alone is upwards of 197k, so plenty of wiggle room with the other 4 spots. honeybun, ELLY and Epic Buttstomp like this. @Greg Nixon: 3 Terence(s), that could too slow for the higher levels where a pig could kill you (probably not at almost 400K health) by turn 3. You won't get no SS until Ded5w1n3 is ready by 3rd turn. Chuck I have few and like it. Don't mind another Master Claude either. But no thanks for another Terence when I can earn a Master Terence at 84. 5-stars Darlene I have no incentive to get. Ergo the reason I said what I said, those 5 are the top with the boost. With 122 prestiged 5 stars I'm not worried in the least lol. @Greg Nixon With a 400K team you should be able to go on auto mode for all levels, maybe even up to 90. The only way you can die is some crazy obstacles that the AI cannot get thru. @honeybun I think you and @Greg Nixon will have no issue destroying this event even if Rovio brought back the old grinder format. It will just take more time. 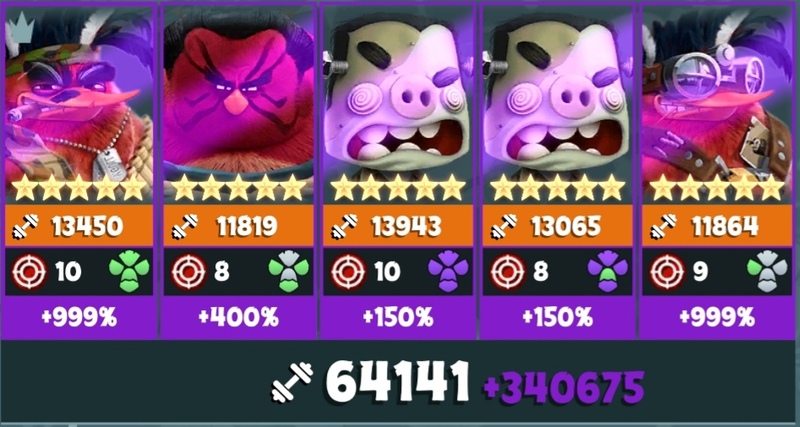 Strategy is probably not important unless there is a pig that can do 400K of damage in 1 hit, sitting in the back, and able to attack before Ded5w1n3 is ready. Some of our problems with this recycle birds is too many golden tickets in the hatchery. You can keep 10 in hatchery unless you buy extra from Rovio. Then they all go to Inbox, you may want to hatch some just to put the count back to safe amount. honeybun, A. Wolf and Nyk like this. Could actually be better in some cases... your best birds would get to shoot more often. I hope, Rovio employs lvl 91-100 fast, wouldn't mind if they get so hard, that even the toughest teams have problems. I do not need to complete every time, I want a challenge. Because, why do we level up the birds to maximum, if that leads to boring game play? I'd love to have an extra category, the 'horrible nightmare' stages from 90-110 for teams with high power... and only very few can make it. @honeybun All Rovio needs is to bring back "Gates of Hell", "3 poles leader blocker", "Inverse C rock lines", etc. All 7 waves please. Those will give nightmares to all birds except white and black. Guess I'm lucky in that those types of layouts really don't phase me seeing they've long been either in the dungeons or in the events going all the way back to the games beginnings. It's really just a matter of using your first shot or two to position the pigs for your heavy hitters. Regardless, wish everyone the best of luck in the event and hatching efforts! honeybun and Rando like this. Didn't everyone complain about all of those layouts begging for them to be removed " because they sucked". Players can't have it both ways. This is exactly why Rovio doesn't listen to us. Rando and honeybun like this.